7th Ring Automotive RAC800 59.99 | What Car? One of the quickest inflators here it took just five minutes 15 seconds to reach 30 PSI on the RAC800s analogue dial. Sadly, when we checked the pressure it was 3PSI under at 27PSI. For such a large and expensive unit wed expect a little more performance and a more accurate pressure gauge. This is the only unit that tested doesn't need plugging in, as it comes with a built-in battery pack. Sounds good, but seeing as pretty much every new car comes with a 12-volt socket, its not really that much hassle to plug a charger in. Annoyingly, if the battery runs out of juice you cant use it again until its charged up even if you do plug it in. We saved 10 Theultimatefinish.co.uk but, still, the RAC800 was the most expensive unit on test. It you think the extra motor (for pumping up inflatables etc.) and the cordless capability would come in handy, the RAC800 is worth a look. Otherwise, save yourself 25 and go for the more compact RAC600. Much of the pressure gauges inaccuracy stemmed from its ridiculously large scale. It went from 0-300PSI, so deciphering the difference between 25 and 30 PSI was hard enough. Trying to adjust by a single (or even half a PSI) was nigh on impossible. The plastic casing was solid, though, and the hefty weight kept it sturdy when inflating. 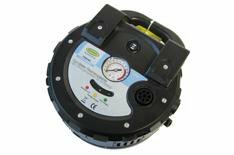 Blowing up airbeds, lilos and inflatable toys is made easy by the separate inflator motor (adaptors supplied). The RAC800 is also rechargeable and can be charged either from a 12-volt socket in your car or the mains plug in your front room. You also get a fabric case, which is handy for storage.